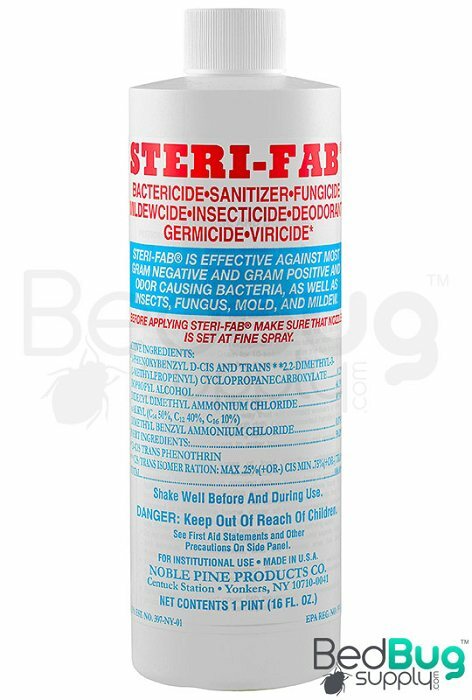 STERI-FAB is a disinfectant that kills bed bugs, lice, dust mites, roaches fleas and a host of other insects. STERI-FAB is also used to disinfect mattresses and is popular with state inspectors. 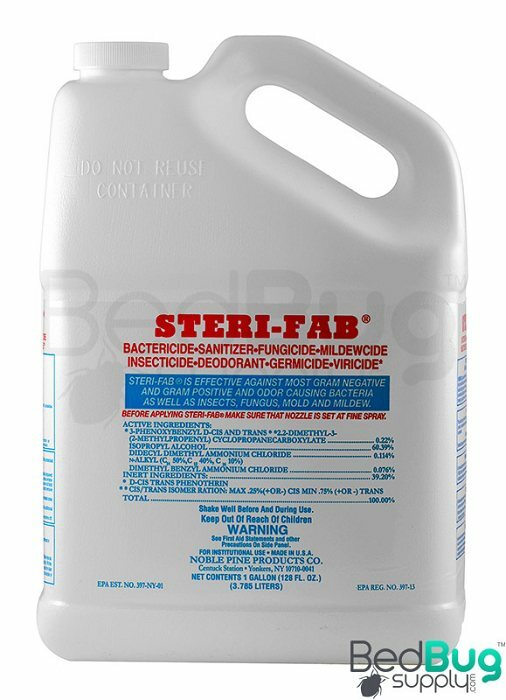 STERI-FAB has been used as an effective contact bed bug killer for many years and is popular for the fact that it evaporates within minutes leaving no residual behind. We like to use STERI-FAB to treat furniture, baseboards, cracks and crevices as well as mattresses and box springs before bedding encasements are applied. Lightly spray the mattress and box spring and allow to dry fully before applying the encasements. 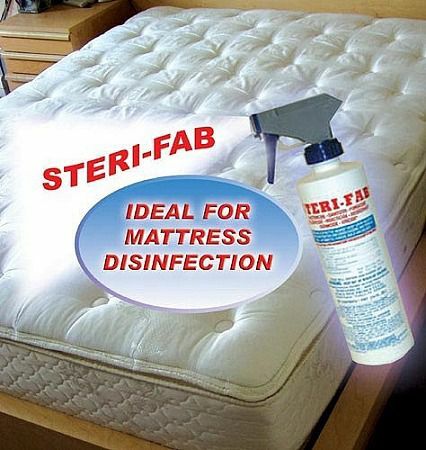 STERI-FAB is also a popular product used by the mattress industry to disinfect pre-owned mattresses. Many state laws and regulations require that STERI-FAB be used allowing inspectors to see with a black light if the mattress has been treated. Always read and adhere to the instructions on the products label to ensure proper and safe usage. 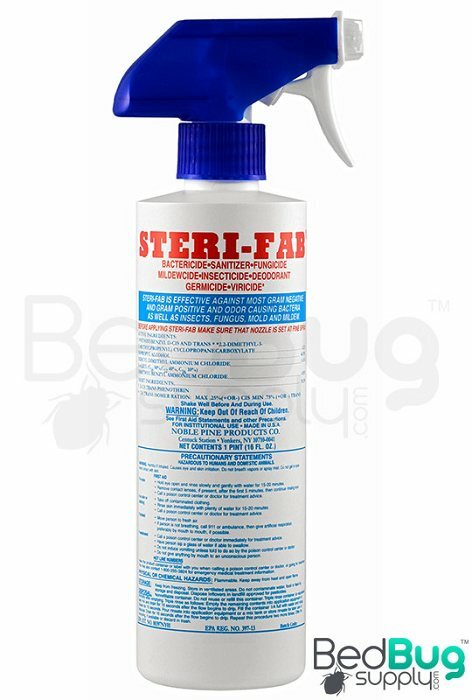 STERI-FAB works as an excellent bed bug and egg killer that dries in 15 minutes leaving very little trace behind. STERI-FAB can be used on just about anything including mattresses, box springs, carpeting sheets, cabinets, table tops, floors, etc. STERI-FAB is a contact killer and not a residual meaning that once it dries, its killing power goes away. 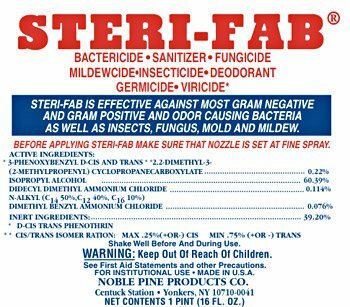 STERI-FAB is one of our best sellers and is popular for its ability to quickly kill bed bugs and their eggs without leaving residual behind. STERI-FAB can be applied onto most surfaces including carpeting, furniture, chairs, baseboards and inside cracks. Inspect every square inch of the infested room for areas where the bed bugs could be hiding. Be sure to treat under and inside furniture as well. 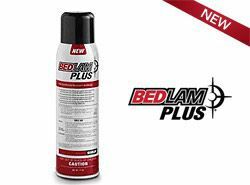 After applying STERI-FAB it's important to then use a residual spray such as our Bedlam Bed Bug Spray or JT Eaton Bed Bug Killer (red bottle) for lasting protection. Another way to use STERI-FAB is to treat your mattress before applying bedding encasements. Simply spray the mattress and box spring lightly and wait about 15 minutes or until completely dry. Once dry, apply the bed bug encasements. Q: How often does the spray have to be used in order to Kill bed bugs? The spray should be used in conjunction with residual sprays and a residual powder, as described in our 4-step solution. If you are following these steps correctly, then you should reapply both your contact sprays and residual sprays two weeks after your initial treatment, then again in another 2 weeks for a total of three applications. Q: How long does the contact spary last after spraying, meaning days, weeks or a no. of months? STERI-FAB is a contact spray, meaning it will kill bed bugs on contact and then evaporate shortly after. It does not have a residual effect that will continue to kill after it has been sprayed. Q: Can you use this product on clothing? This product is NOT labeled for use on clothing, so don't use it for that purpose. Also, please do not spray anything on clothes that you will be wearing shortly after, or spray directly on your person. Make sure to always follow the product label and MSDS. Q: Is product approved by E P A? Yes, STERI-FAB is approved and registered by the EPA for use against bed bugs. THE EPA Reg Number for STERI-FAB is 397-13. Q: By non residual do you mean that I can spray fabrics and then have contact with those fabics without harmful effect to me? Yes, once it evaporates and the surface feels dry to the touch, it will be safe for you to come in contact with the surface. 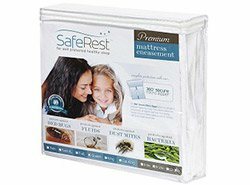 Q: My mattress had been encased in a bedbug cover can or should I spray this on the cover? Once bed bug encasements have been applied, no additional spraying on the mattress or box spring is needed or recommended. You should have already treated the mattress and bed frame with contact and residual sprays, and then applied ClimbUp Interceptors under the legs of the bed to stop bed bugs from entering your bed. Q: What square footage does your product cover? I need to know how much to get? I think my home is about 300 square feet. I live in an RV. It's difficult to estimate usage by square foot because this product isn't intended to cover all of a room or home. Spray should be focused on the cracks, crevices, seams, folds, and joints that bed bugs are likely to be hiding in. Spraying all over open areas is not recommended. Q: Does the gallon bottle come with a sprayer? No, the gallon size does not come with a sprayer. 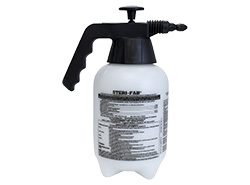 You can use the STERI-FAB Continuous Action Spray (CAS), or most water spray bottles. Q: If sprayed onto mattress, box spring, and dust ruffle, how long does it last? Regardless of where it's sprayed, STERI-FAB only kills bed bugs on contact. It will evaporate shortly after being applied, and has no lasting residual effect. Q: We wear protective goggles when spraying sterifab. Is it necessary to wear gloves and or facemasks? According to the product's MSDS, protective gloves and eyewear are not required. However, we still advise that you play it safe and wear gloves and long-sleeved clothing. We have been a a battle to the death with bed bugs over the past 2 months. We have tried everything including bug bombs and at least 6 different types of hardware sprays. We purchased Steri-Fab along with other products and it actually worked to our surprise. Sterifab works great and it doesn't leave behind any oily residue. Good to see a company that does what they say they do! Reviewed by: Mary from Ohio. Reviewed by: vanda from harrisburg pa. OMG!! I just received the bottle, came home stood up the mattress. After a few sprays bed bugs slowly came out and slowly dying. I finished a 16oz bottle on my mattress! Reviewed by: Rita from Austin Texas. Reviewed by: james ferguson from cincinnati ohio. Reviewed by: Habitat for Humanity ReStore from Georgetown KY. Reviewed by: james from texas. This was the most effective product we found that actually got rid of our bug problem. The cost is extremely reasonable compared to a professional exterminator (upwards of $1600) it just requires a little time, effort, and diligence on your part and your problems will be gone. Fortunately we caught it before it was out of control. Like it says, it does not stain the walls or furniture, but you have to make sure you are not too close when spraying because it can leave a residue on finished hardwood surfaces. 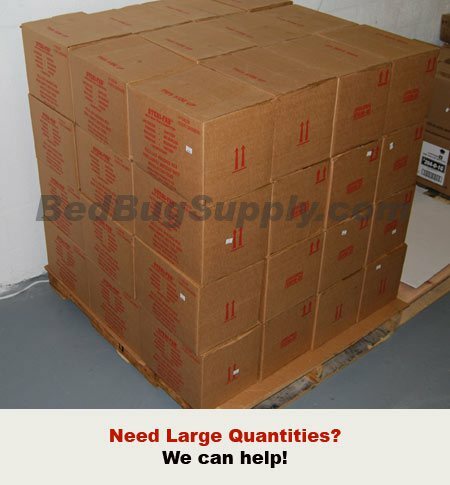 Thank you BedBug Supply for making this product available and affordable to the Average Joe homeowner. Reviewed by: Lee from Ohio. Was shipped lightning fast and worked as advertised. Great product from a reliable source. Reviewed by: TD from IA. Reviewed by: Monique from Michigan. Reviewed by: Tonicia Scott from 447 Cambridge Lane Jackson MS 39212.